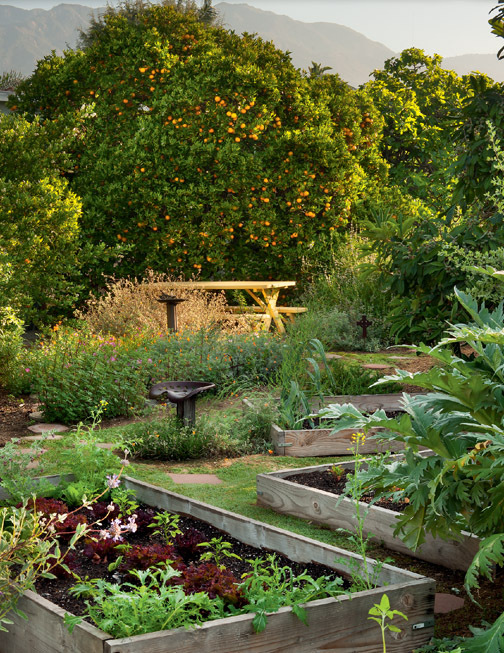 IF THERE IS ONE TRUTH about gardening, it must be this: there is no such thing as a stingy gardener. The practice of digging, planting, tending and nurturing one’s own plot of earth attracts a generous spirit, a caretaker, someone for whom sharing is simply second nature. If you need evidence, just wait until the zucchini or tomatoes are in season. 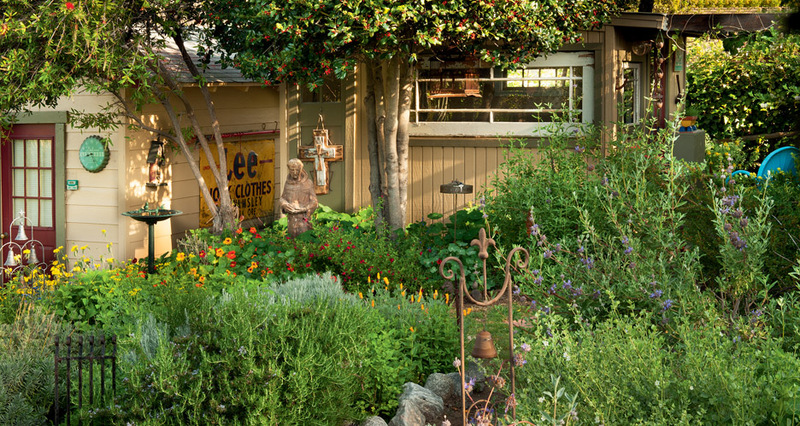 Come August, there isn’t a workplace in America without a cardboard box of surplus homegrown vegetables and a sign proclaiming, “Take some—free to a good home.” Gardeners just can’t help sharing the joy of making things grow. What waits behind that gate is a verdant pleasure indeed. The gardens surrounding this modest bungalow, situated on a generous one-third-acre lot, have been thoughtfully arranged in a series of “rooms.” You find yourself drawn from one lovely setting to another on pathways of brick, stone and gravel. You’re struck at once by the openness of the grounds and the inviting intimacy of the smaller enclaves within them. Well-tended fruit trees frame the edges of the property, some dating from the 1920s. Many have come as gifts from Martha’s father. Within that framework are the vegetable gardens, raised beds with plenty of native wildflowers close by to encourage pollination. Everywhere you turn are irresistibly cozy spots that invite you to sit, relax and enjoy the view, sharing it more often than not with an astonishing chorus of songbirds. The wonder of this place is so much more than its visual beauty. It’s a feast for the senses. 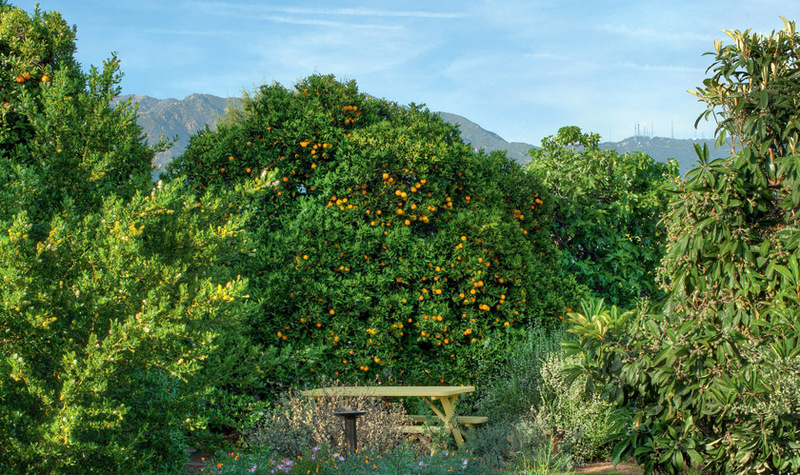 The sounds of the birds, the smell of sage strategically placed to brush you as you walk past, the warmth of the sun on your skin, the tang of a tangerine plucked from a low-hanging branch—you count yourself lucky to spend an afternoon exploring these gardens. But you can’t help imagining … wouldn’t it be wonderful to live here? 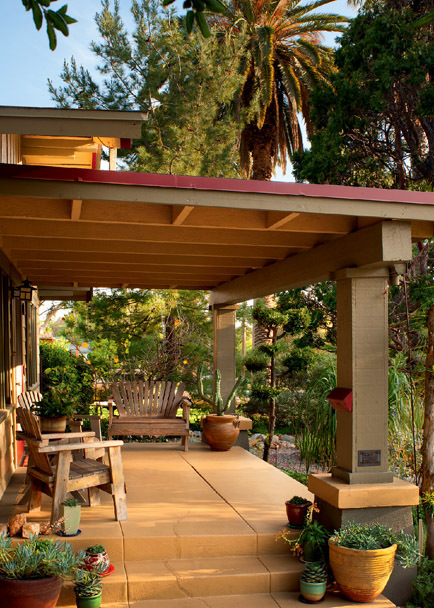 Martha, a life coach and adjunct professor at Pasadena’s Pacific Oaks College, has owned the home since 1975. She gives Debe, a school administrator, the lion’s share of credit for revitalizing the gardens and giving them a sense of purpose. 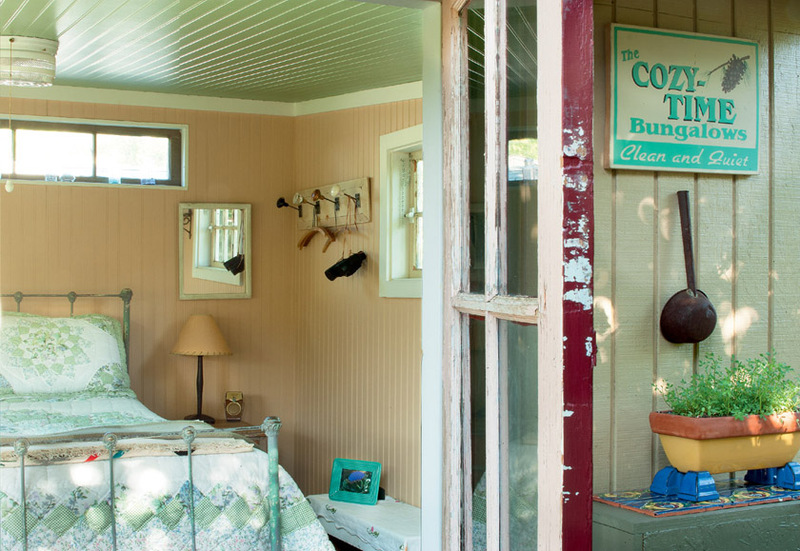 Before the garden project could be properly brought to fruition, the bungalow needed to be restored. Like many older homes, it had suffered a 1970s modernizing remuddle. The original bathroom had been gutted, the classic subway tile and original porcelain fixtures replaced with a fiberglass tub and vinyl flooring. The kitchen didn’t escape either. Fortunately, though, the great bones of the house still showed. 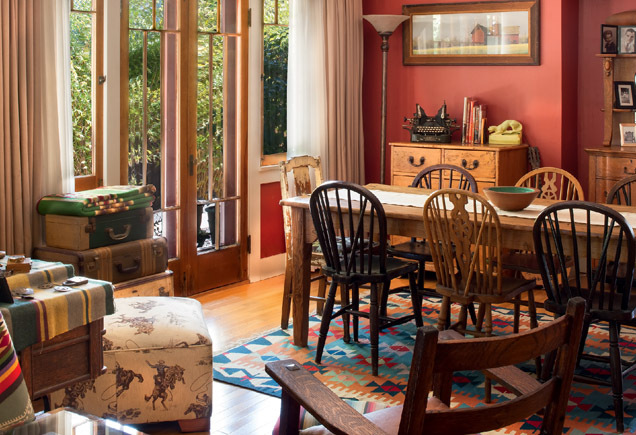 A call went out to troops from Oregon: Debe’s best friend, Sara Berry, whom she calls “Builder Supreme.” They tore out the fiberglass, brought in a clawfoot tub and period-appropriate tile for the bathroom, installed butcher-block countertops in the kitchen and painted the exterior in true bungalow colors. Then they turned to the yard. With a third of an acre to work with, Sara had plenty of room to show off her building skills. 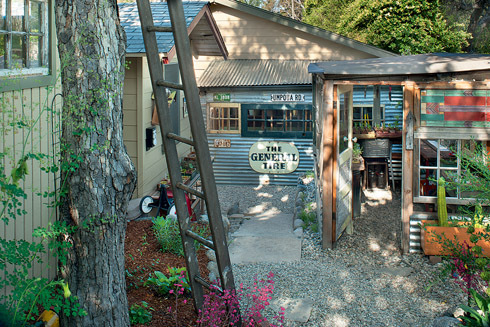 Using repurposed materials and architectural salvage, much of which she had carted from Oregon, she and Debe built a greenhouse, a tool shed, a storage shed and a wonderfully inviting guest house. Although the charming group of buildings seems well-planned, Debe says they made it up as they went along. Then it was time to concentrate on the gardens themselves. Though Debe’s main goal was to restore indigenous plants and the wildlife that feeds on them, there is another compelling reason for Californians to go native: the state’s near-constant drought status. To the rest of the country, Southern Californians may seem a bit spoiled, at least where good weather is concerned. But with the constant warmth comes a major problem—most of the region’s water comes from somewhere else, and those remote sources won’t last forever. According to the Los Angeles County Waterworks Districts, 70 to 80 percent of residential water is used outdoors for lawns and gardens. In recent years, homeowners have been asked to reduce their usage by 20 percent. 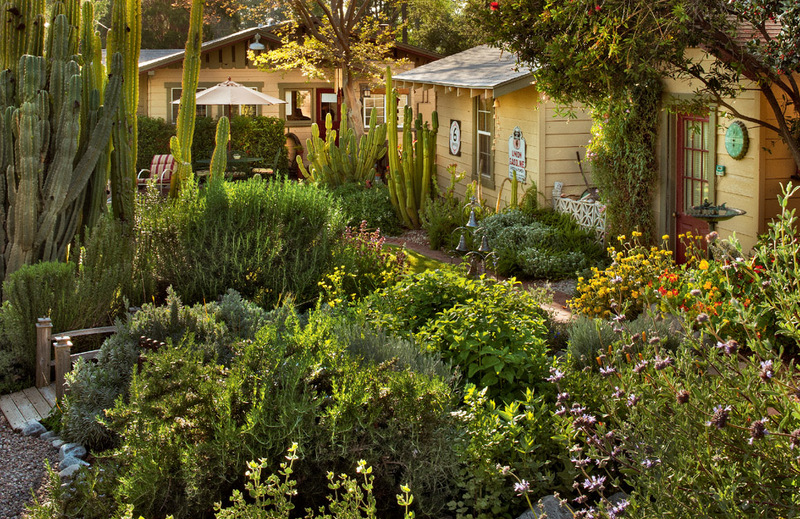 Debe and Martha have already reduced theirs by more than half, simply by using native plants. Once they’re established, natives don’t need the constant watering required by lawns, roses and azaleas. 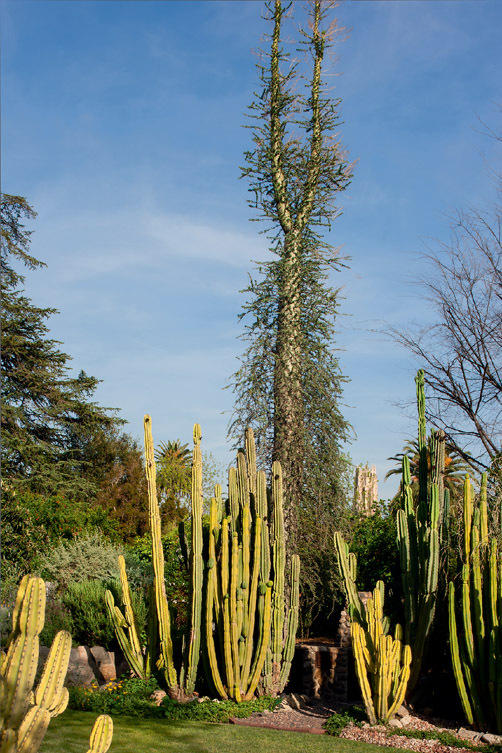 They’re programmed for a Mediterranean climate— dry summers, rainy but brief winters. The lush gardens surrounding the bungalow are the direct result of restoring plants that belong there. But now, when an existing plant dies it is replaced with a native species. 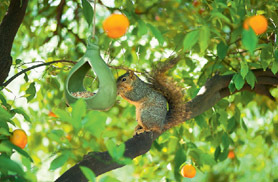 This both conserves water and encourages wildlife by providing needed food. Butterflies and their larvae, for example, are notoriously particular about what they eat. Now, the gardens virtually shimmer with butterflies and other beneficial insects—and, of course, the birds that feed on them. Martha agreed. She invited Lily Singer, the foundation’s director of special events, to come out and inspect the gardens. Debe and Martha were understandably nervous as she moved from one bed to the next. “She didn’t say much,” says Martha, “But as we walked her out to the driveway, she said, “Well, I hope you’re ready for 400 people to walk through your yard.” The gardens were an immediate hit on the tour—so much so that they’ve been invited back ever since. This year was their fourth. For years, Debe has shared her love of gardening with visitors, but she also takes her plant knowledge on the road. Partnering with the Theodore Payne Foundation, she is bringing native-plant gardening to some of the most underserved students in L.A.—kids she says are “surrounded by pavement.” As Chief Operating Officer of the LA’s BEST (Better Educated Students for Tomorrow) program, Debe teams with Lisa Novick, the foundation’s Director of K–12 Education, to install gardens at schools throughout the district. So far, they’ve installed six gardens, with great success—attendance is up, and the kids are becoming enthusiastic native-plant experts.